Excellent location, thoughtful arrangements including plenty of towels, cleaning materials, etc., food in the fridge, wine, coffee, tea, fresh fruits; in short, remarkable place to stay on a visit to Corfu. Walking distance to the old town and restaurants. Two minutes from the beach. We had a great time. The host is wonderful. Harry met us at the airport and brought us to the apartment. We were impressed by the quality of the apartment and its fixtures and fittings. We were grateful for the welcome pack of food and drinks which was a lovely touch. The patio area was a generous size. The location of the apartment was in a pleasant residential area just a short walk from the sea front. It was a 20 minute easy walk into the lid town along the promenade. At the end if pur stay Harry kindly took us back to the airport for which we were very grateful. The apartment had everything one could need on holiday. The fridge was full of welcome goodies (beer wine orange juice bread ham and cheese) and the apartment had toiletries, band aids as well as olive oil, salt and pepper and even pasta should you feel the need to cook dinner (we didn't as there were so many cute taverns within walkable distance from the apartment). It took about 25mins to walk into town. Tip- The parking in Corfu is dreadful...if you want to walk into town drive your car and park along the water front as far as you can...and then follow the water line heading towards the new fort (you can't miss it) and that halves the walking time..it helps if it is a hot day. The check in was wonderful too. Thank you. Very clean and modern, lovely touch having food, fruit and bottle of wine all available. Thanks also for the lift to and from the airport. Lovely apartment, great location, fantastic hosts. The host picked us up at the airport (5min drive from the apt) and gave good advice and suggestions for eating and attractions. He arranged for us to be taken to the airport at the end of our stay. There was also a generous welcome basket of fruit, bread etc so we ended up no needing to buy breakfast for the four days we were there. The tv had Netflix so we could put our feet up after a long day of exploring Corfu. The location of the apartment to cafes, town and water was terrific. Very quite area. Local supermarket nearby. Amazing apartment. Amazing host. Everything was super clean, tidy, organized. You have everything you need from beach towels to water/tea/coffee/cocoa! The living is small together with the kitchen, nice big bathroom with washing machine, bedroom and terrace. 5 minutes from the beach, 20 minutes from the old town, 20 minutes to the airport and 30 minutes till the place where you can see landing airplanes. All walking distance. If we ever come back to Corfu, we come back to Charilaos! Lock in a great price for Mon Repos Apartments – rated 9.9 by recent guests! One of our top picks in Corfu – and a guest favorite. Located in Anemomylos area of Corfu Town, Mon Repos Apartments feature a terrace. The unit is 0.8 mi from Corfu Town and just 500 feet from the sea. Free WiFi is available throughout the property. There is a seating area and a kitchen. 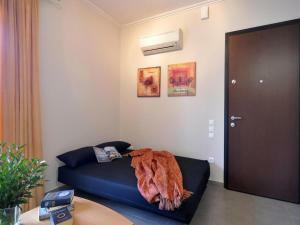 Towels and bed linen are featured at Mon Repos Apartments. Other facilities at Mon Repos Apartments include a terrace. An array of restaurants, cafes and shops lies within a short walking distance. Glyfada is 6.2 mi from Mon Repos Apartments. Corfu International Airport is 0.6 mi from the property. This property also has one of the top-rated locations in Corfu! Guests are happier about it compared to other properties in the area. This property is also rated for the best value in Corfu! Guests are getting more for their money when compared to other properties in this city. When would you like to stay at Mon Repos Apartments? This apartment has a electric kettle, toaster and washing machine. The flat is 42 sq metres and is located on the ground floor of a new development. Its interior is made up of a bedroom with a double bed and a spacious wardrobe, a bathroom with a walk-in shower cubicle and washing machine and an open plan kitchen/living room with a comfortable sitting area and a fully equipped kitchen. Through the sitting area, guests will have access to their private terrace, with well-tended flower beds and a marble table with chairs. The terrace looks onto the grounds of the oldest church in Corfu, with a magnificent ancient Byzantine basilica and a lovely tree orchard. The sitting area includes a sofa which can be converted to a double bed (190x140cm) and a comfortable armchair. The kitchen is fully equipped with fridge, oven, hob, microwave, toaster, boiler and a dining-room table that can comfortably accommodate four persons. Guests will be able to enjoy free air-conditioning, wi-fi, and digital LCD TV. Parking is readily available and free outside the property. I am a 32 years old biomedical engineer and a wholesales medical equipment supplier. Anemomylos is a beautiful and highly desirable area of Corfu, located at the southern end of the picturesque bay of Garitsa, where swimmers can enjoy uninhibited views of the Venetian old fortress. Overlooking the waterfront are many wonderful restaurants, cafes and tavernas offering high quality service and magnificent views, while grocery stores, local markets and bakeries are also around the corner. Anemomylos also boasts a number of ancient and historic sites. Ancient Greece is represented by the ancient temple of Artemis, within the area commonly known as "Mon Repos", where you can also find a wonderful beach and the summer palatial residence of the former Greek Royal Family. The ancient church of Saints Jason and Sosipater, dating from 1,000AD (which is visible from the flat) is considered a masterpiece of Byzantine architecture, while the archaeological museum of Corfu lies just a short walk away and houses unique exhibits spanning the pre-classical and classical ancient Greek eras. House Rules Mon Repos Apartments takes special requests – add in the next step! Guests need be quiet between 12:00 AM and 8:00 AM. Free transfer from the airport or port is provided. Please inform Mon Repos Apartments of your expected arrival time in advance. You can use the Special Requests box when booking, or contact the property directly using the contact details in your confirmation. The bed was a little hard for me but my husband liked it. Otherwise nothing is wrong with this apartment. Very friendly owner that was more than happy to pick us up and drop us off to the nearby airport. The apartment was very clean and well furnished and was stocked with all that you would need for a few days stay, including complimentary Mythos and a bottle of wine!! We will definitely stay here again!!!!! The owner picked us up and dropped us off from the airport. The apartment was spotless and the bed and sofa bed were both very comfortable. There was fruit, wine and some beer in the fridge as well as some other bits and pieces. It's a great area with some nice restaurants and a short walk along the coast to the Town centre. I also recommend a visit to Mon Repos just round the corner which has a quiet beach. Beautifully maintained and presented apartment. Very clean, comfortable, quiet area very good facilities. Many useful extras provided & a lovely welcome basket of fruit & wine. Charilaos is a very kind host who collected us from & returned us to the airport. Thank you for a very pleasant stay in Corfu.